Latest Football News, Soccer Results, Goals, Transfers talks and Rumors: Football transfer rumours: Tottenham to beat Arsenal to Mario Balotelli? 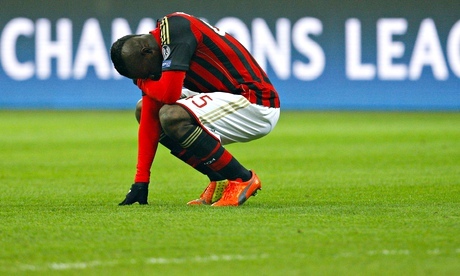 Football transfer rumours: Tottenham to beat Arsenal to Mario Balotelli? The number of entertaining, occasionally frustrating but ultimately lovable Italian strikers plying their trade in the Premier League could increase by one next season, should Arsenal or Tottenham realise their ambition of bringing Mario Balotelli back to Blighty from Milan. The headline-grabbing former Manchester City goal-getter is wanted by both north London clubs, with Spurs reported to be offering their £30m misfit Erik Lamela and £10m in readies in the hope of getting their man. Authorities at north London's Holloway Prison have been put on red alert. The world looks to be Celtic and occasional England goalkeeper Fraser Forster's lobster, if reports suggesting that wad-waving representatives from Real Madrid, Milan, Juventus, Barcelona and Atlético Madrid are ready to form a disorderly queue outside the Celtic Park personnel department turn out to have anything resembling a ring of truth to them. In other goalkeeping news, Napoli's on-loan-from-Liverpool stopper,Pepe Reina, has hinted that his future does not depend on Napoli's results this season and suggested that maybe he needs to go back toLiverpool at the end of his loan, to make a decision there. "My future does not depend on Napoli's results this season," he said, after Napoli's Europa League win over Swansea. "I need to go back to Liverpool at the end of my loan and I will make my decision there." With Arsenal struggling to convince right-back Bacary Sagna to sign the new deal they've been waving under his nose, Inter are ready to pounce and offer the 31-year-old France international a change of scenery in Serie A. Believed to be on the verge of signing Manchester United centre-half Nemanja Vidic, the Nerazzurri, as reported in Rumour Mills passim, also like the cut of Patrice Evra's particularly well-tailored jib and may also attempt to prise Tottenham midfielder Étienne Capoue away from White Hart Lane during their summer transfer trolley dash. Capoue arrived at Spurs from French side Toulouse last summer and they'll send him on his way again if they can recoup their £9m outlay. Manchester United's eagerly anticipated summer splurge has been the source of much speculation and reports today suggest former City defender Stefan Savic, the lank-haired Montenegro centre-half currently plying his robust trade at Fiorentina, is being teed up to replace the Vidic-shaped hole in the heart of their defence. Steven Nzonzi's wet Wednesday nights at the Britannia Stadium could be numbered – the French midfielder has let it be known he'd quite like to move elsewhere as he's dissatisfied with the number of first-team opportunities he's getting from Mark Hughes. Having failed to buy a single player during the bewildering reign of Joe Kinnear as director of football, Newcastle boss Alan Pardew is hopeful that his employer Mike Ashley will loosen the purse strings and provide him with something resembling a transfer kitty to bring in two or three new recruits during the summer. Newcastle have just posted a £9m post-tax profit, which won't get you much in the current climate, a point conceded by Pardew as he dropped a sledgehammer subtle hint about launching a potential recruitment drive. "We haven't got Qatar money, we haven't got that kind of finance," he said. "We are going to need at least two or three signings who come straight into the team or have a very good chance of starting. I think we have to be a lot more active than we have been for a while because we are looking light in certain areas." And finally, crushing disappointment this morning for talent scouts at Arsenal, Manchester City and Tottenham, after Croatian tyro Alen Halilovic has announced he's repelling their coquettish advances and taking up with Barcelona. The highly sought-after 17-year-old midfielder took to the interweb to say: "Thanks Dinamo Zagreb for everything!! My first club and biggest love!! Now is time to move on to Barcelona." He's bound to have an enjoyable weekend, here's hoping you do too.